In this second interview with a dA artist, I took the opportunity to interview another very near and dear colleague about his practice. I thought my simple five questions would yield the typical short form answers. I should know to never pretend to know anything about Mr. Villanueva…. Grab a beverage and enjoy…. dA: I have known you for many years and have seen your work many times at the dA Center for the Arts. What was your first show and how were you introduced to the dA? Angel Villanueva: I tend to think of my first public mural as my first show. I started painting murals in Mexico when I was 17. My first gallery experiences in the U.S. were student art exhibitions at Mt. San Antonio College, which are actually hard shows to get into when you consider the number of entries and the caliber of curators brought in to make the selection. Then came the dA Center for the Arts. 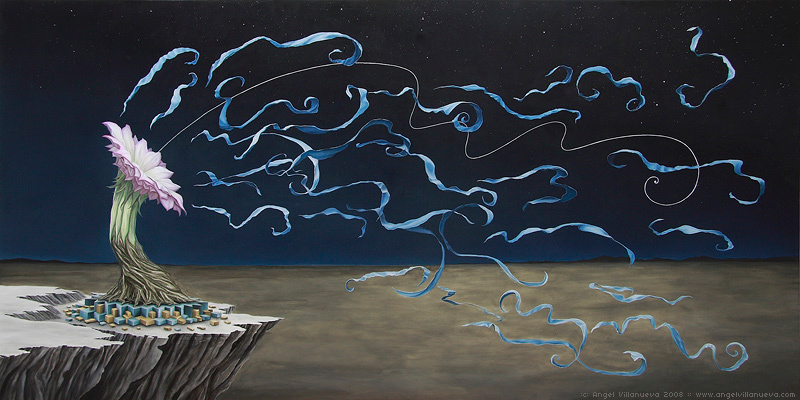 I learned about a call for entries and submitted to it my very first oil painting, Birth of Man. It was selected by curator Frank Garcia for the first annual Returning to Aztlan exhibition. That was my first gallery show outside of an academic environment, and a yearly Pomona tradition I have been part of ever since. 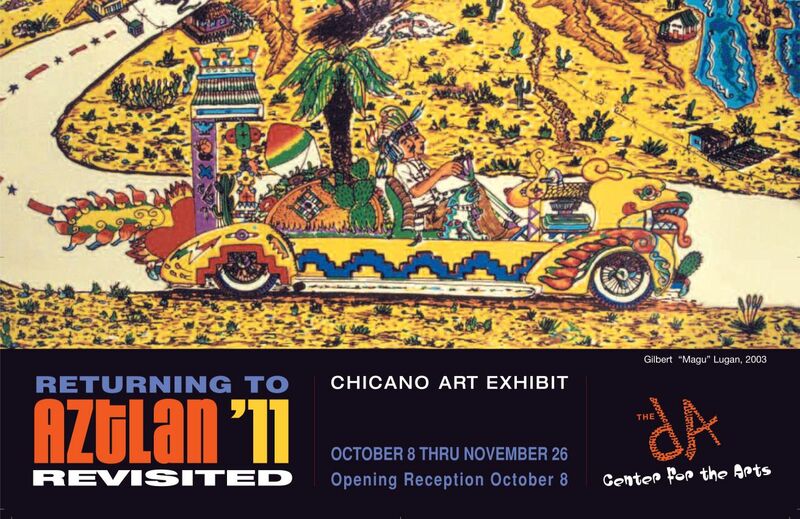 dA: Your latest oil on canvas, The Tree of Knowledge, is currently featured in the dA Center for the Art’s 9th Annual Chicano Art Exhibition “Returning to Aztlan: Revisted”. It is a very poetic piece with many layers. Can you please describe how it fits into a show with the wordAztlan in its title? AV: The main thematic resonance is that The Tree of Knowledge and Returning to Aztlan’s sensibility are both rooted in origin myths. The parallel can either continue or diverge from there, depending on where you’re standing and which direction you’re looking at. The Tree of Knowledge is the first of a series titled Paradigm Lost, an exploration of primordial garden mythology—it is difficult to speak of it without its sister works, because it is a quote out of context. The Aztlan myth itself has a direct link to a primordial garden predating and influencing Mexica aesthetics, a subterranean paradise depicted in the frescoes of Teotihuacán. But my series is also divergent and in many ways divorced from any longing to return to a place called Aztlan. I’m after something elusive, something that plays in the space between our documented mythology and our empirically understood reality. We can recognize mythology as an illusion, but aren’t our very own historical events—as well as our memories—a kind of illusion too? Unknowable scenarios intrigue me. These quantum states, these Schrödinger’s cats are what I’m inspired by: moments dead and alive at the same time. dA: You’ve expressed to me before that you don’t really consider yourself to be a “Chicano Artist”. Can you please also speak to this a little bit? I see you wield the key to Pandora’s box. This is a challenging issue to address, because both Chicano art history and my own history are complex documents in constant revision as our self-understanding matures and evolves. There are strong identifiers between my sensibilities and those of Chicano art, but also some radical divergences. My parents were illegal immigrants, farm laborers. I was born in a California barn surrounded by strawberry fields. Spirited away to the Baja California desert in Flight into Egypt fashion, I did not come to live in the U.S. until I was 18, once I could make the great escape alone. After growing up in the rural expanses of the Colorado Delta and the lush cosmopolitan polestar nested in colonial architecture that is Guadalajara, I was in culture shock when I came to Los Angeles. Initially, I did not understand what “Chicano” meant. I viewed Chicano expressions, especially those coopting pre-Columbian imagery, as confected and uninformed. 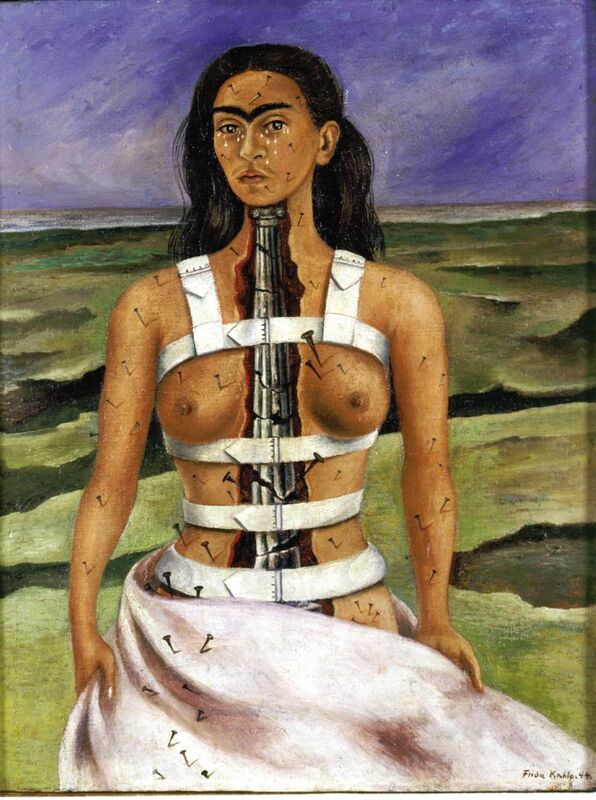 For years, I had no trouble expressing distaste for local displays of Aztec dancing and endless reimaginings of Frida Kahlo—someone whose work I’d understood and admired since I was 12—because these were things I came to know through the Mexican academic system, which operates on the notion that historical traditions are only conjured up for formal purposes, and are to be regarded as reenactments rather than contemporary expressions. That, then, was the point of view of an outsider, a Mexican student. I was coming at it from a place of cultural privilege, an “I’m the real thing” attitude. I don’t feel that way today. It took years of exposure and study for that to change. In fact, I am convinced it will take a while for any outsider to understand Chicano culture on its own terms. You can’t really speak of Chicano art as a category or set of forms, or put qualifiers on its aims, because it arises from very specific social and historical circumstance, and the perspectives fueling it cover a wide territory. I understand it now as a polychrome, multidimensional phenomenon, producing expressions spanning a huge spectrum of artistic possibility; from whimsical craft to worldly sophistication, with many a heroic effort to speak of. Chicano art may have solidified into a well-documented movement and a minutely scrutinized set of expressions, but it wasn’t always so. Originally, it was a response to a threat, a loosely defined identity birthing itself as a result of socio-cultural disenfranchisement. I’ve been privy to this creative struggle in a very direct way: as you know, Gronk has been my friend and mentor for years. Studying with him has been tremendous; I’ve learned most of what I know about life as an artist from him. He is very studious, and very aware. Gronk plays his brain like a virtuoso plays an instrument, feeding his intellect and guiding his visions without forcing them. It’s a beautiful thing to witness, and following suit has been life-defining. In this sense, I could say I am a disciple of the Chicano Avant Garde, even if the choices I make visually, the things I respond to, and the places my work takes me to are of a different nature. Overall, I see my relationship with Chicano art as one of kinship and understanding: I am also a cultural in-betweener, weaving a path between past and present, between Old World and New World sensibilities, without representing or belonging to either—a child of no one. I lost my mother when I was a young teen. I was forced to brave the most confusing and frightening years of my life unsupervised by adults. Life in the U.S. has been a series of trials and explorations as well. I have lived in multiple worlds, without truly identifying with any. I, too, have to respond to the threat of a system that tells me, in no uncertain terms, that my views and expressions are irrelevant, and that I simply do not belong. I have to constantly create myself by calling out to the past and drawing from within, all while remaining squarely in the present and looking to the future. It is a complex dance, one that Chicano artists know well. I could describe myself as a Mexican-American artist, but even that feels inaccurate. I may be a U.S. citizen by birth, but I’m an immigrant by fact. In a decade, I will have spent more time in the U.S. than I have in Mexico. How will I feel then? More American, or like a man in exile? I don’t know. I will tell you when I get there. dA: Your work has a definite surrealist feel to it. How did growing up in a rural desert town play an influence in your overall work, including your writings? AV: My fascinations are the result of a long journey across events and influences. The desert itself is surreal: towering sand dunes, magnificent sunsets, vast wastelands, secret waterways, wild animals, hidden rock formations… We had no electricity. I’ve never seen deeper, more spectacular night skies. The Milky Way is burnt into my memory. My first artistic influence was Guadalupe, my mother. She was a singular creature: intelligent and creative, she loved to read and nurtured what she perceived as my gifts in every way she could think of—she bought me my first watercolor set when I was 7, and so my first painting was born (I wish I had it today, it was a man on fire). Although we lived in a merciless desert, she managed to create an oasis around our little property. Our garden was filled with fruit trees, rose bushes, cactus plants and all sorts of flowers and vines. I remember delicate cactus blossoms in the moonlight, and beautiful night moths coming to pollinize them… It was a magical reality to my young mind, but I also understood that this reality was created, that the garden around us was the work of my mother’s hands guiding nature’s grace. It wasn’t all beauty. My early life experiences also gave me the clear impression that the worlds we create for ourselves do not quite mesh with the natural world. We lived in abject poverty. My house had a dirt floor. We had no running water, and shoes were something I wore only to school and church. I had to work in the fields to help out, picking cotton and harvesting grapes. I had a wheelbarrow which we filled with water jugs; I had to make daily runs for drinking water to the nearest place who would give us some from their faucet, which was nowhere near. And tragedy would visit soon, propelling me to ask questions no one could answer for me. By the time I was 12, I was taking refuge in our library, and I soon came across an encyclopedia of psychology. I dove into it, and it was there that I saw Salvador Dali’s Burning Giraffe for the first time, in a unit about psychoanalysis. I was hooked. I began investigating the surrealists and their relationship with the subconscious, and soon found myself staring at a painting of a woman in tears, her naked body split open, the crumbling pillar inside failing to support her. It hit me hard. My mother was ill already. That’s when I knew: It is possible. There is a way to express that which cannot be spoken. That was the beginning of my life as an artist. I began drawing diligently, every night. It was cathartic, and it helped me to navigate my way through those years. I have a collection of intricate pen and ink drawings from that time. They are raw works, hard for me to even look at today. Eventually, the images evolved. 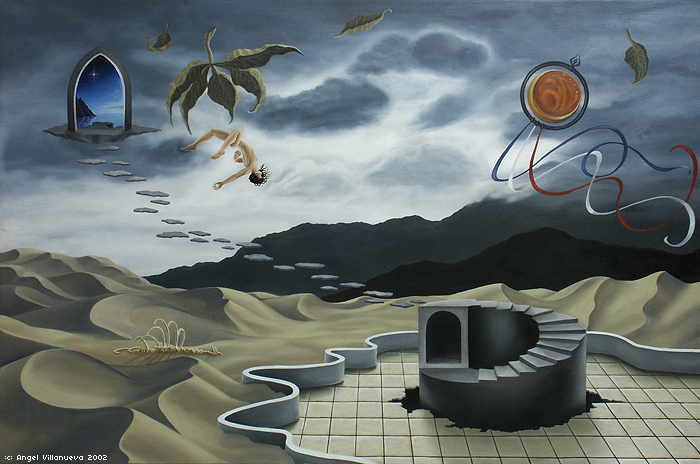 I began painting dream-like scenarios in acrylics when I moved to Guadalajara, after my mother passed. It was there I discovered and fell in love with magical realist literature, which is what has inspired and influenced my writing since, and something that continues to inform my aesthetic in general. dA: You recently traveled across Europe, how did these travels play an influence in the way you think about your art today? AV: I was invited to participate in a privately funded artist residency at L’Ermitage di Garessio, in Northern Italy. My month there was spent drawing, eating, drinking, and, I suspect, being a general nuisance to my hosts. It was a fun time, but the real impact came from the two months I spent studying museum collections. I was transformed. I actually started at the National Gallery in Washington D.C. I spent five hours in front of Vermeer’s Woman Holding a Balance, analyzing every layer, every nuance of hue and value, every detail, every brushstroke… A museum guard was by me at all times. He must have thought I was crazy. I did the same thing with every Vermeer I could find on my itinerary—eleven of them—taking copious notes and photographing them in detail; overtly where I was allowed, ninja-style where I was not. I came to feel I was chasing Vermeer, summoning his hand from the grave. That, as well as studying the works of countless other great painters, afforded me a huge amount of new knowledge. But there was much more to it than that, far more than I could possibly tell you here. I must have looked at least at a million works spanning all of human history, from pre-historic artifacts to Demian Hirst’s infamous shark in a tank. I was able to spend significant time with every single thing that caught my eye. I can’t really quantify the impact of such an experience. I think it may take years for it to unfold to full consequence. Even my photography took a leap forward. It was a first step, a direct investigation of our human heritage, and I plan to continue it. A more immediate result of traveling was returning to Los Angeles under the curious impression that I live on an island. It doesn’t take a whole lot of effort at any given moment to assemble a series of examples of art in L.A., about L.A., by L.A. artists, reviewed by L.A. critics, for an L.A. audience. Nuestra Señora La Reina de Los Angeles spends an inordinate amount of time putting on makeup and combing her hair in front of a mirror. This is, of course, an oversimplification, and I by no means intend to say the entities involved are to be faulted. When you contrast Los Angeles with any major European city it is very easy to see how the combination of fragmented subcultures and the lack of easily accessible, direct physical routes (read: railroads) to other urban environments of import makes for an insular experience. And this is a fractal phenomenon, holding true down to the suburban level. Ever tried getting to the beach from Pomona using public transportation? Los Angeles County is a superorganism suffering from chronic bad circulation. Also, to state the obvious, you become very aware of the fact that the United States is a young nation. There is not a place here where you can walk on a thousand-year old sidewalk or drive by a two-thousand year old building that is always there, reassuring you that life goes on. Five centuries later, we live in the aftermath of the conquest; we’ve been thrown together and are still trying to figure out how we fit together. At times, I have the impression that art here is treated like a novelty rather than a component of society, and that we become instantly self-congratulatory when we think we’ve achieved cultural advance. This frightens me, perhaps because I don’t fully understand it. To me it presents the risk of mishandling our relevance in a global context, and I don’t think you’ll find a whole lot of people who will tell you that this is a good idea. For a series of images taken during this trip please visit Angel Villanueva’s blog entry, Voyage. dA: What’s next for you, where do you desire your artistic endeavors to take you from here? AV: For the past decade, I’ve followed my muses rather than guiding them. I’ve painted when I’m inspired, when there’s something to express, something that I can’t hold back and I just have to do it or I go crazy. I’ve exhibited my work when opportunities arise that I feel are fitting. I’ve had my first solo/retrospective and have been successful at placing my art in private collections—all very organic. That era of my life has ended. I thought of myself as an emerging artist, but in light of the convergences I’ve experienced, I feel like I was actually preparing to emerge. I am now operating in a much more mature fashion, approaching art-making with far greater insight, and achieving better results. But I’d be lying to you if I said that I am or wish to be in control of where I am going. It’s a hard balance to strike, to structure your output and extract the best of your creative ability without compromising your principles, wandering away from what you believe in, or stunting your own growth. Here’s an interesting example: I’ve experienced waking hallucinations, visions of sorts, often and at random times, since I was about five or six (I suppose this explains why I’ve never felt the need to do drugs). However, in the four years I spent studying art theory at the Claremont Colleges, I had only one vision. One. That’s how my painting The Visionary came to be: it appeared in my mind, complete, in a moment I turned inwards during a particularly tough lecture. Allocating most of my cognitive bandwidth to the acquisition of a solid theoretical framework through which to understand human expression was necessary, but it came at a price. In art-making terms, higher education left me confused and unproductive. I think of it as my Dark Ages. So I’ve had to spend some time undoing the knots placed in my thinking by academia, opening myself up to experience, and balancing what I’ve learned with the reason I create art in the first place: Because it’s who I am, what I love, and there is nothing else for me to be, nothing else worth being. The visions are slowly returning. It’s been a kind of re-awakening, and I am glad to be back and in command of myself. My life has been an extraordinary adventure, from the dust of Baja’s desert to Alaska’s glaciers to the top of the Eiffel Tower, and every single great experience I’ve had has been a result of trusting the process and allowing the creative flow to emerge authentic. That is my focus, and my goal. dA: Where will your work be shown in the near future? AV: I just finished painting two murals in La Habra, one of them the largest image I’ve ever painted. The work required scaffolding and brushes tied to the end of sticks. That was a very fun and challenging project on a number of levels, not least of which was the fact that its aesthetic guidelines fell outside my track record and it was great to let go of my concerns about that. The place is called La Barca and the food is great, I highly recommend a visit. I am currently painting a mural at Pitzer College in Claremont, which should be done within the next couple of months. It is a 150 square foot wall, the composition a surrealist vision, and I’m trying a couple of new things in it. I am also right in the middle of preparing two series of easel works: Paradigm Lost is a series of revelations, obscure moments in origin myths never described by sacred texts. Anima Suspensa is a group of nighttime dreamscapes in a lyrical desert, informed by my own memories. And I have a couple of interesting surprises planned for 2012… I’ll keep you and the dA informed as the particulars on these shows solidify, and you can always visit my Facebook page and website for announcements. One thing is certain: I’ve exhibited at the dA Center for the Arts for a decade now, and plan on doing so as long as you’ll have me! Thank you so much for taking the time out of your busy schedule and of course the dA will always be a home for your new ideas and old friends.